Most scientific papers are unlikely to change your day-to-day approach as a Rails web developer. How not to structure your database-backed web applications: a study of performance bugs in the wild Yang et al., ICSE'18 is the exception to that rule. In total, there are 40 problematic actions identified from the top 10 most time-consuming actions of every application. Among them, 34 have scalability problems and 28 take more than 1 second of server time. That means one-third of controller-actions doing significant traffic are problematic😲. Wow. Database performance woes aren't solved once, like forgetting to gzip an HTTP response body. They appear in new ways as more data, more users, and more features are added to an app. In this post - the first of a two-part series - I'll show how to use Scout to quickly identify your own app's problematic controller-actions using similar reasoning as this study. In the next post, I'll show how to recognize ActiveRecord performance anti-patterns using Scout. In other words, we'll start with the forest, then look at the trees. What is a problematic controller-action? 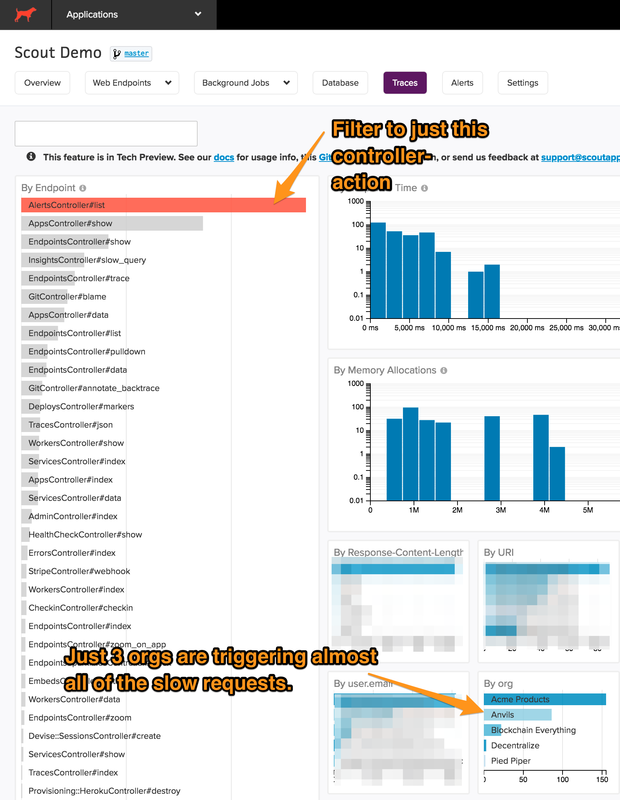 The controller-action is among the top 10 most time-consuming (response time * throughput) AND (spends more than 1 second on the server side OR performance grows super linearly as the database size increases). In short, the paper categorizes problematic endpoints as those with performance issues (slow, on average), scalability issues (response time grows linearly or worse with the size of the data), or both. If you don't have a Scout account, signup for our 14-day free trial and install + configure the scout_apm gem. Once deployed, Scout will begin tracing every web request and ActiveRecord query. This will give us the data required to identify problematic controller-actions. This ensures a small blip over a short timeframe doesn't send us down the wrong track. Done. Of the 107 unique controller-actions that handled traffic, I've filtered down to just those consuming a significant amount of time. It's unlikely that a scalability issue causes a performance issue for everyone all at once. Instead, power users (those with more data) are likely to hit these issues first. Scalability issues often look less like a slowly worsening performance profile and more like a histogram with an unnatural distribution (ex: always slow for a particular URL path, fine for others). You can add custom context that is relevant to your Rails app with Scout's simple API. Some likely candidates: the id of the current user, their monthly spend, and the id of their parent organization. Of this app's 1,000 slowest transaction traces, over 25% are triggered by AlertsController#list. This action renders a list of performance alerts for a given application monitored by Scout and didn't appear in our list of slow actions. It smells like a scalability problem. We're looking for indications that a controller-action is slow in specific scenarios. Performance isn't randomly slow. Instead, it's possible that these three orgs have apps with many alerts. This is a scalability problem. This is very close to the average number per-app in the study, which found an average of four problematic controller-actions per-app. 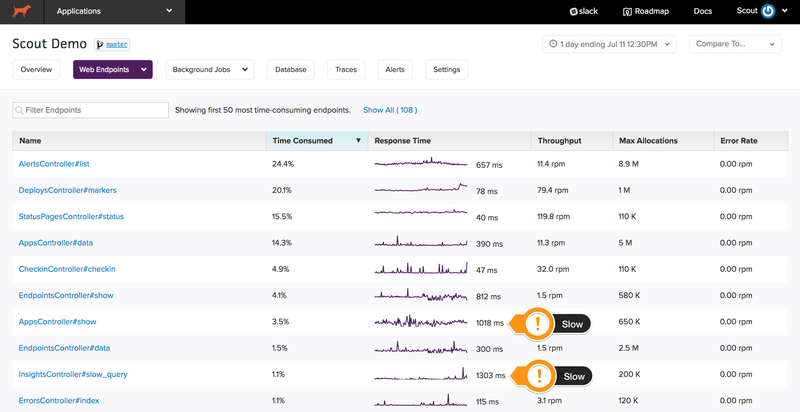 This filtering is very important: this app has more than 100 controller-actions receiving traffic. Almost every endpoint has some optimization potential, but we want to focus our efforts. Focusing on five endpoints is a lot easier than randomly knocking out issues. Now that we've identified our problematic controller-actions, its time to use Scout to identify any ActiveRecord anti-patterns we've unintentionally implemented. Stay tuned for part 2.